The new company web-site was issued on 17.7.2017. We changed the design to obtain a fresh and modern look, we rearranged the structure to improve the search for products added more relevant information. The web-side is now compatible for use in mobile devices as a fully responsive application. Enjoy the new design. Navigate yourself through the easy-to-use menu and discover all the information about our company and its products and technology lines. In contacts you will find direct phone numbers and e-mails on persons responsible for the respective departments of the company. The contents of the web-site will be continuously extended and new products and technology lines will be added with new pictures, parameters and descriptions of function. The web-site is also being translated in foreign languages. 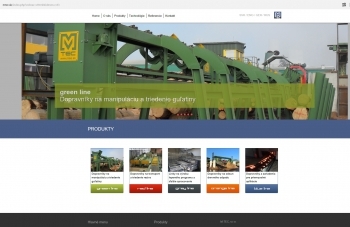 We hope you will enjoy our new design of the web-site and that it will be helpful for you. In case of any inquiries feel free to contact us. We will be looking forward to your response. 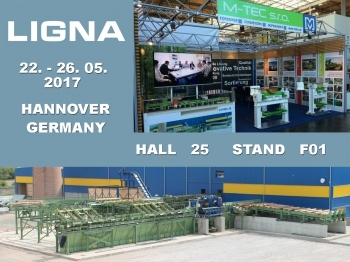 The international wood trade-show LIGNA in Hannover, Germany takes place in May 2017. Our company M-TEC is attending as an exhibitor. You can find us in the Sawmill Technology section in the hall 25, stand F01. You are kindly welcomed to visit our stand. We can present you our achievements we accomplished in the past years, newly designed machines like on-line linear turning of the boards, complete mechanisation for stacking of long glued beams, cross-cutting saws for MDF or glued boards. We look forward to help you also with your new projects and to bring your new visions to life. The activities of our company M-TEC are focused mainly on supplying of complete technologies for sawmilling industry and the production of conveyor systems according to the customer ´s demands in different industrial sectors..